Tomorrow night, street art and graffiti magazine VNA prepare to launch their 18th issue to the world with another of their regular release parties in London. The new issue looks to be one of the best yet, with an epic line up featuring cover star Conor Harrington, Mode 2, Shawn Barber, Shoe, Ronzo, Remi Rough and more. As always, a number of limited edition covered issues will be available at the launch, but if you can’t make it down, you can enter yourself into a lottery for a chance of scoring one of an extra 20 limited edition copies. 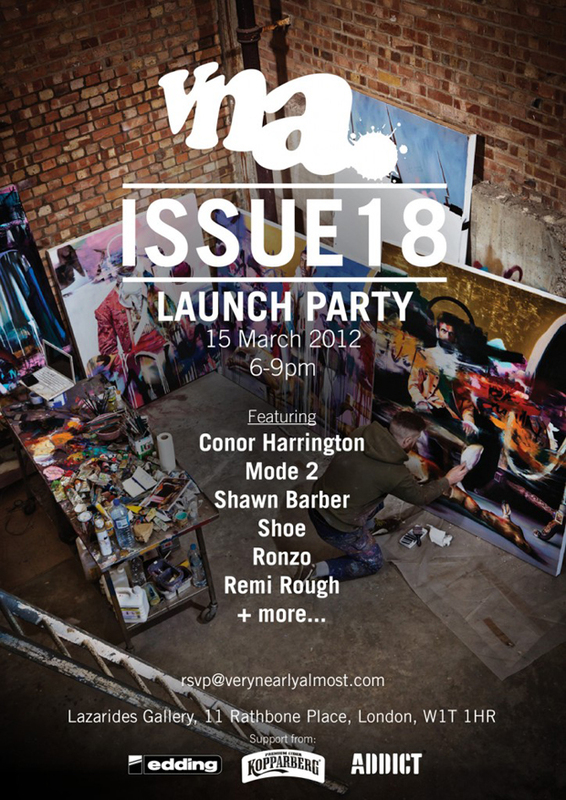 The launch takes place this Thursday evening (March 15th) at London’s Lazarides Gallery, coinciding with Conor Harrington’s ‘Dead Meat’ show. For more information, check out the facebook event or head to VeryNearlyAlmost.